Astrocladistics is about cladistics in astrophysics, or classification of complex astrophysical objects in evolution, particularly galaxies. This is my research subject since 2001. 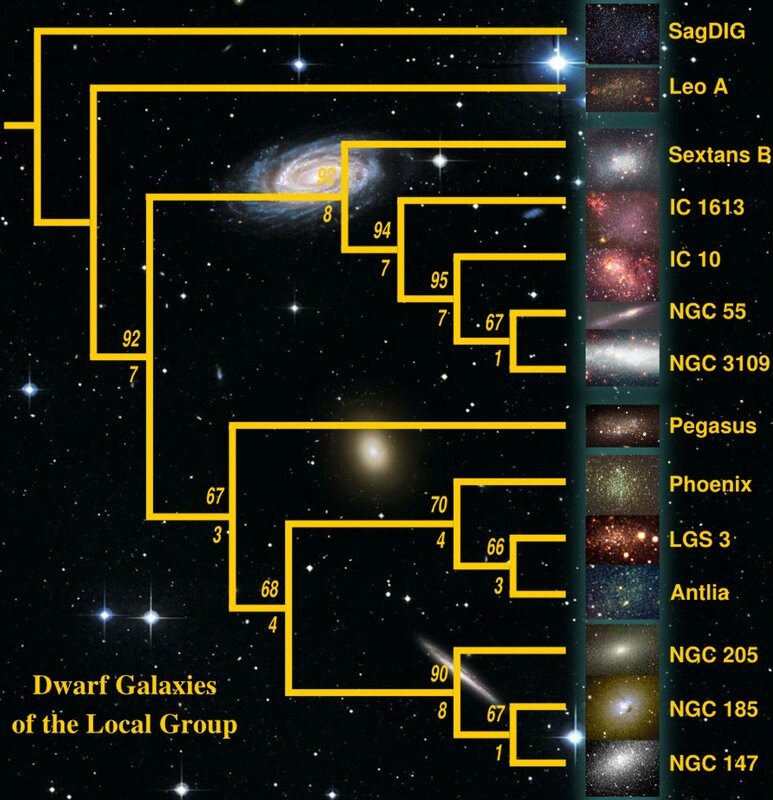 Cladogram(*) of 14 Dwarf galaxies of the Local Group obtained with 24 characters (observables and derived quantities). Bootstrap values (above) and Decay indices (below) are indicated for each node. The outgroup (SagDig) has been chosen because it has the lowest amount of metallic material, suggesting that it is made up of more primordial material (see Fraix-Burnet et al 2006 for details on this work). This blog, created August 1st, 2011, is intended to be the place where I present and explain the concepts, the techniques, the results, the failures, of astrocladistics, in a different way than in the published papers. I have also written a book, in french, that you can download: De la diversification des galaxies. This blog is thus a web site on astrocladistics, aimed at researchers from many disciplines, but hopefully it could become a place of discussions and (why not?) new collaborations — hence a Science blog.